Sandy Dunes is a small North Myrtle Beach resort in the Windy Hill section of North Myrtle Beach, South Carolina. Located just behind the dune line and steps away from the white sandy beaches, this oceanfront North Myrtle Beach resort has charm and appeals to families. Sandy Dunes is a three-story North Myrtle Beach resort where all of its North Myrtle Beach vacation rentals face the Atlantic Ocean and have an oceanfront balcony. Chose a three-bedroom, two-bath North Myrtle Beach condominium at Sandy Dunes and you will have accommodations for eight or 11 people. All of these condos in North Myrtle Beach, South Carolina are nicely maintained and tastefully decorated. And each North Myrtle Beach condominium at Sandy Dunes is an end unit so there are windows throughout these rentals. The living space of these North Myrtle Beach condo rentals is one big great room. The kitchen looks onto the dining area, which overlooks the living room at these Sandy Dunes North Myrtle Beach rentals. Each kitchen is well equipped with full-size appliances, including a dishwasher. Use the kitchen of these North Myrtle Beach condominiums to make hot breakfasts and picnic lunches or just use the kitchen appliances to keep your drinks cold and make popcorn for movie nights. There is an oceanfront balcony in each of these condos in North Myrtle Beach, South Carolina and they are accessed via the living room and the master suite. Open the sliding glass doors and sea breezes blow inside bring the salty scent of the Atlantic Ocean and the sounds of crashing waves. Being at Sandy Dunes for your oceanfront North Myrtle Beach vacation is refreshing because the ocean sights permeate the windows and sunshine streams in for everywhere. The amenities in the North Myrtle Beach vacation rentals at Sandy Dunes include at least one DVD player, washing machine and clothes dryer. Take advantage of all of this and have a family movie night during your North Myrtle Beach vacation. And with a washer/dryer unit at your fingertips you can do some laundry with ease, too. Some of these North Myrtle Beach condo rentals have high-speed Internet access available. If that is a feature that is important for your family then Sandy Dunes is a North Myrtle Beach resort that can accommodate you. 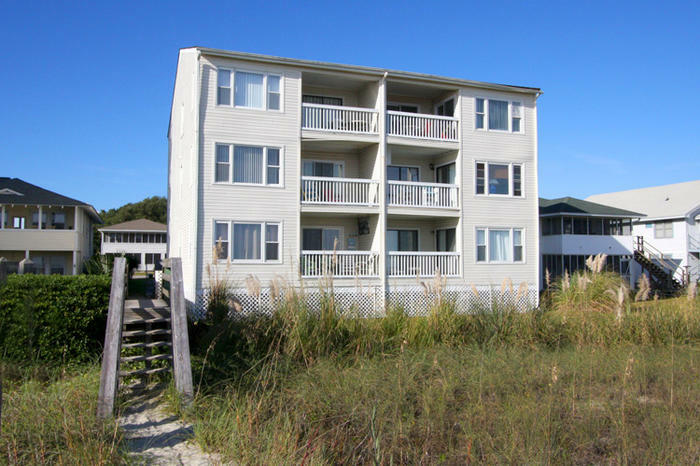 Elliott Beach Rentals is not affiliated with onsite management or the HOA of Sandy Dunes.